SHACC Limited Edition Portfolio Available Now! Rick Griffin (1944-1991) first reveled in the art and politics of the counterculture as a surfer. A teenager in Southern California during the late 1950s and early 1960s, he developed the seminal cartoon-strip character, Murphy, published in Surfer magazine. Griffin's rebellious and prankish cartoon character initiated the surf cartoon genre and helped define the look and voice of the incipient surf culture. Griffin, a pioneer of surf cartoons and psychedelic album-cover art, lived in San Clemente during the 1970s. He died in a 1991 motorcycle accident. Griffin's Quigley murals are among the earliest examples of his surf cartoon art and are among the few murals from this period to have survived. Nationally recognized architect Rob Quigley grew up in a bedroom in Pacific Palisades lined with these murals painted by artist Rick Griffin. Quigley's work has garnered more than 60 design awards from the American Institute of Architects (AIA). In 2005, the AIA California Council honored Rob with the Maybeck Award-California's equivalent of the Gold Medal-for three decades of architectural design excellence. Quigley points to Griffin as a strong early influence. Thank You to Joe Knoernschild for rescuing the artwork which was on the walls of Quigley's former residence (which was being demolished), and to Hal Forsen and John Warren for all their help in transporting, cutting down, and hanging these pieces for display in our museum! 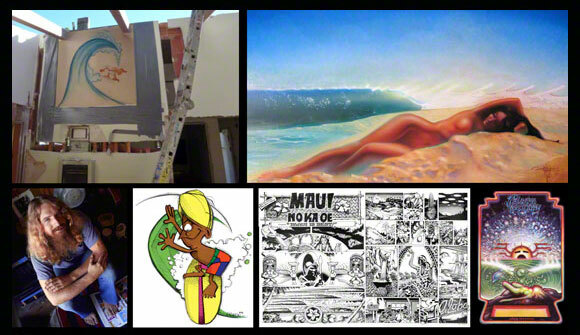 The artwork right before it was removed and the house was torn down, and some of Rick's later work, including "Curse of the Chumash," Murphy, SURFER magazine's "Maui No Ka Oe," and Pacific Vibrations.